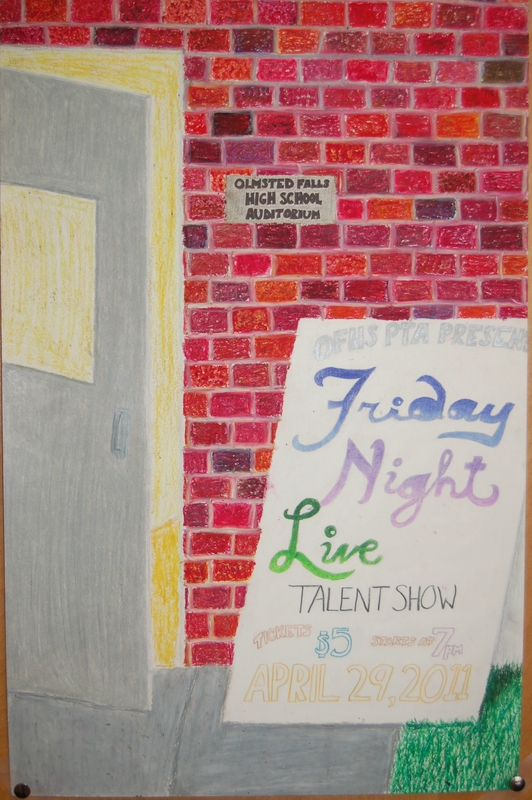 JOIN PTA FOR THE ANNUAL FRIDAY NIGHT LIVE TALENT SHOW this Friday, April 29th at 7:00 p.m. in the Olmsted Falls High School Auditorium. Student Talent, Local Judges, Lots of Family Fun!! Have you cast your vote yet? To date, there have been more than 4,400 absentee ballots issued and 3,106 returned. If you have requested an absentee ballot, please be sure to mail it back in today! If you are not voting by absentee, please be sure to mark your calendar to vote at the polls this Tuesday, May 3rd! EVERY VOTE COUNTS! The 2.8 Mill Permanent Improvement Levy on the May 3rd election ballot is a critical issue for the Olmsted Falls School District. Any parent or resident who may still need additional information or have questions on this important ballot issue – which WILL NOT increase the current level of school taxes – is urged to contact the Board of Education office at 440-427-6000. • A YES VOTE WILL provide a dedicated funding stream for permanent improvement projects and purchases with an estimated life or usefulness of five years or more. • A YES VOTE WILL help lengthen the span of time before next operating levy is needed by expanding the District’s ability to handle looming maintenance expenses in older buildings without tapping into limited general fund dollars. • A YES VOTE WILL provide resources to immediately expand the District’s ability to address issues at the 42-year-old High School facility – a recurring concern expressed by Bulldog parents in the recent Parent Survey. • A YES VOTE WILL NOT provide any funds for salaries nor benefits. By law, P.I. funds may NOT be used for this purpose. Many, many thanks to all of our Bulldog families who are proudly displaying “YES FOR SCHOOLS” yard signs! This collective effort has helped increase awareness of this important P.I. Levy. If you would like to display a yard sign, or need a replacement sign for one that has been lost in the recent storms, please e-mail your request to prideinolmstedschools@gmail.com with the phrase “Yard Sign” as the subject. Provide your name and street address in the e-mail, and a sign will be delivered to your yard. Yard signs can also be picked up at the Board of Education Office located in front of the High School. Please feel free to stop in anytime between 7:30 a.m. – 4:30 p.m. on school days. Thank you again for your continuing support! Due to the continued upward movement of fuel prices, Olmsted Falls School District will most likely need to generate an additional Purchase Order to cover fuel costs above the originally estimated amount for the current fiscal year. Fuel prices on April 20, 2011: Gas $3.59/gallon; Diesel $3.71/gallon. 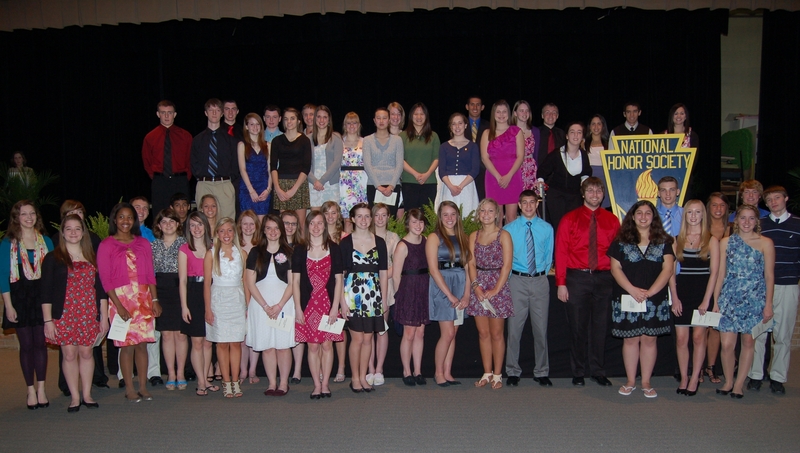 Current and newly inducted National Honor Society members at April 21st NHS Induction Ceremony at Olmsted Falls High School. Congratulations to the following OFHS students who were selected as the new members for National Honor Society: Victoria Alai, Kristin Allen, Nick Asadorian, Katherine Ashmun, Desiree Belford, Lori Bertrand, Amber Black, Kevin Candow, Ryan Fashempour, Jessie Feldman, Melissa Fowler, Holly Hammeren, Elizabeth Hawkins, Olivia Henton, Pam Keller, Samantha Kuehn, Kathryn Lappin, Scott Loeffler, Emilie Macek, Timothy McClaren, Jillian Mesaros, Ashley Michel, Maddie New, Ashley Raffay, Erica Reiser, Denton Sagerman, Hayleigh Sanders, Sohan Vartak, Margaret Winterich, and Zachary Zaruba. The formal NHS Induction ceremony took place last Thursday in the OFHS auditorium in front of a capacity audience of parents, family members and fellow students. Current NHS members participated in the Induction Ceremony by introducing each new member individually. Olmsted Falls Intermediate School will host its annual Career Day on Tuesday, May 17th from 8:30 a.m. to 10:30 a.m. OFIS is looking for 12 more speakers to add to our list of guests who will meet with kids in the classroom to talk about their interesting careers. If you are interested in volunteering for this fun and educational event, please contact OFIS School Counselor Mr. Mark Tabar at 427-6520. A number of students in Latin I, II, and III courses at Olmsted Falls High School recently took the National Latin Exam – an annual examination promoting the study of Latin and encouraging individual student achievement in the language. 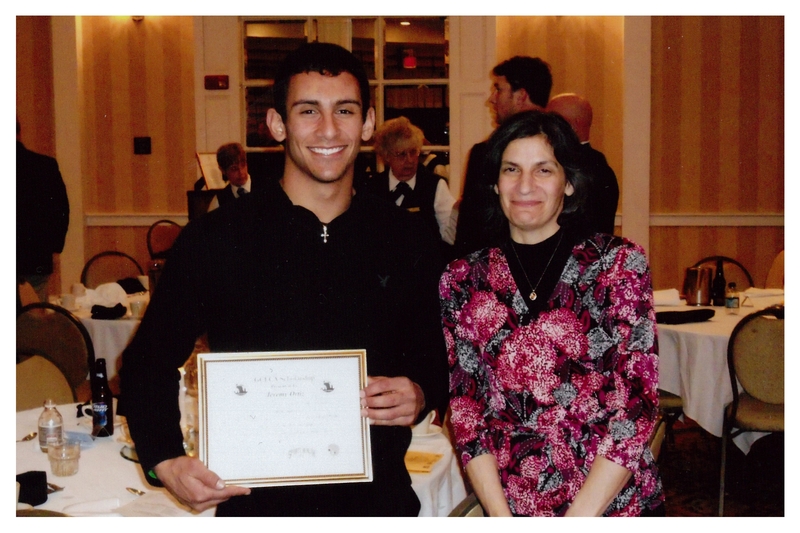 GCFCA Scholarship winner Jeremy Ortiz with his mom, Maureen Saundry-Ortiz, at the GCFCA Awards dinner. Congratulations to OFHS Bulldog Jeremy Ortiz, who received a $750 scholarship from the Greater Cleveland Football Coaches Association. Criteria for the scholarship included GPA requirements, along with plans on playing football at the college level. Jeremy was presented the scholarship at the recent GCFCA Awards Dinner. Jeremy will be attending Tiffin University this fall to continue his educational and football careers. 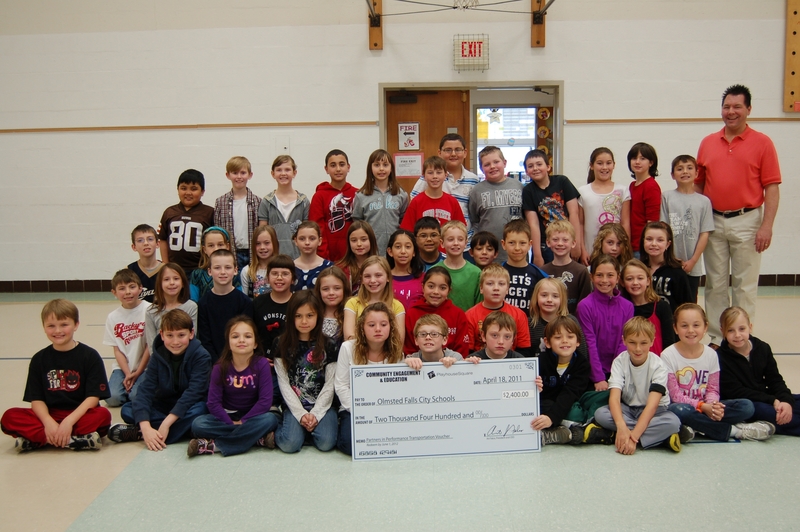 Third grade students in the classes of Mr. Klembarsky and Mrs. Reitz proudly brought back a check donation from Playhouse Square presented to the Olmsted Falls School District. The donation in the amount of $2,400 helps cover transportation charges associated with field trips to Playhouse Square. The Olmsted Falls Board of Education honored members of the Bulldog staff at their regular monthly meeting last Wednesday, April 20th. Twelve staff members made a series of presentations to School Board members about the Six Sigma projects they have completed over the course of the last several months. These in-depth projects required extensive training, skilled analysis and innovative thinking. The end products ultimately resulted in increased efficiencies in select areas of District operations. Following the Six Sigma project presentations, these staff members were formally recognized as Six Sigma Yellow Belt graduates. 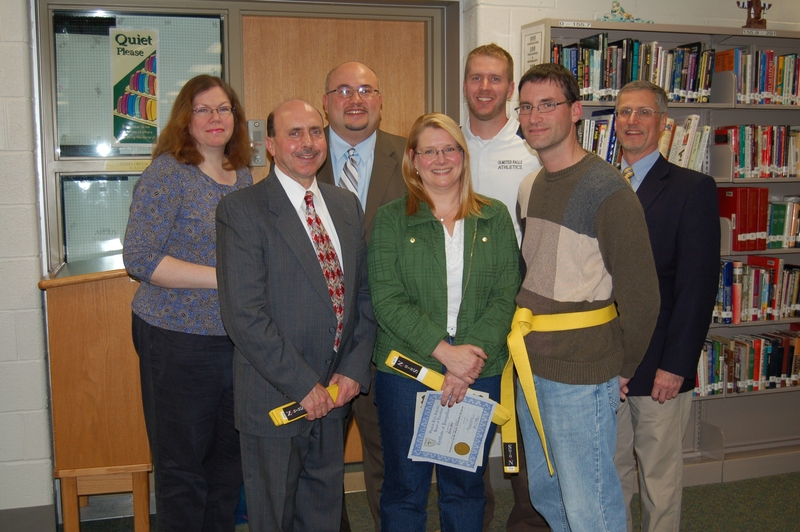 Each was presented with a certificate and their own yellow belt to make things official. Staff members Tim Atkinson and Jan Holecko were joined on their Transportation Team by a Bulldog parent, Greg Surtman, who had an interest in participating in the Six Sigma project. We thank Mr. Surtman for his valuable involvement in this project. 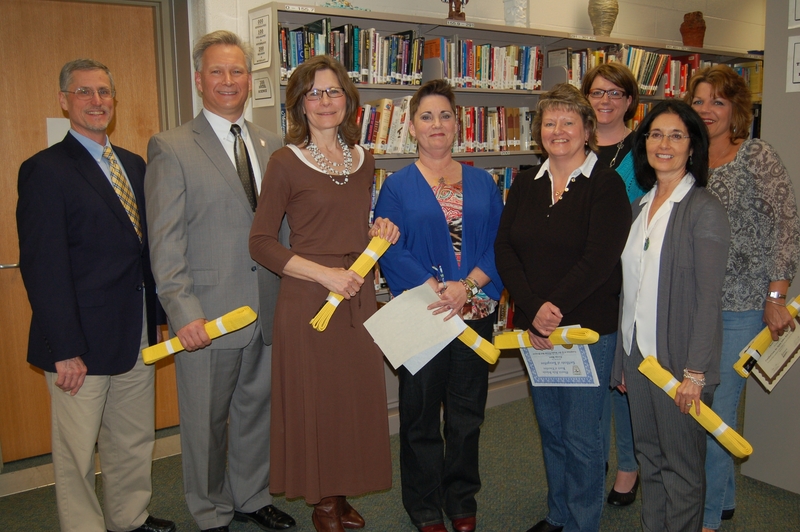 Congratulations again to all of these Six Sigma Yellow Belts! As reported on last week’s blog, 8th graders from Olmsted Falls Middle School have just returned from an educational trip to Washington, D.C. Did you know that, prior to their departure, students were visited by a WWII veteran as well as a soldier recently back from a tour of duty in Afghanistan? The day before the students left for D.C., a full day of lessons were planned in preparation for the places the group would visit. Within these lessons, social studies teachers included two special speakers that would help enhance students’ knowledge of monuments that they would visit. 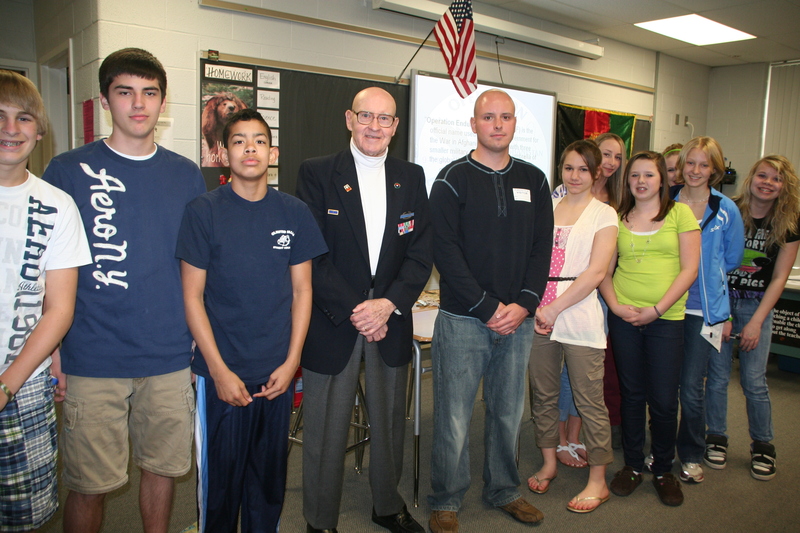 WWII veteran Mr. Bill Bristow and current soldier Mr. Dan Dean (former Bulldog) spoke with 8th grade students prior to the annual trip to Washington, D.C.
WWII veteran Bill Bristow spoke to students about his experiences as a soldier, helping to make the students aware of the symbolic meaning of the WWII monument before they visited it. Dan Dean – a former Bulldog – also spoke to students about his experiences on his most recent tour in Afghanistan with Operation Enduring Freedom. Mr. Dean just arrived back in the United States at the beginning of April from a six month tour. He helped the students understand the significance behind the Pentagon Memorial and the Flight 93 Memorial in Shanksville, Pennsylvania. Many thanks to both of these gentlemen for helping bring history to life for our students! And thank you again to Capt. Mike McClelland – another Bulldog graduate – who joined students for their visit to Arlington National Cemetery. 1) For the fourth consecutive year, the High School ran its “Stall Day,” where select classrooms can “stall” their teacher’s lesson for the day to count and roll change that the class has brought in that day. This year, the proceeds totaled $775, and will be divided amongst, and donated to, the Olmsted Falls Relay for Life teams. JOIN PTA FOR THE FRIDAY NIGHT LIVE TALENT SHOW!! – THIS FRIDAY, April 29th at 7:00 p.m. in the Olmsted Falls High School Auditorium – $5.00 donation at the door. Student Talent, Local Judges, Lots of Family Fun!! Mark your calendars! OLMSTED FALLS MIDDLE SCHOOL PTA 4TH ANNUAL CALENDAR RAFFLE – $5 GIVES YOU 31 CHANCES TO WIN – REGISTER BY THIS FRIDAY, APRIL 29TH! Each day in May, a name will be pulled and winners will be notified. You may purchase as many calendars as you like. If you have friends, family or coworkers that may enjoy this opportunity, please pass it along to them. Please click here to download your raffle calendar. Registration form must be returned with money to your school office by April 29th in an envelope marked OFMS PTA to be eligible. Checks should be made payable to OFMS PTA. Money raised will be used for assemblies, field trips and scholarships. OPERATION MEDICINE CABINET RETURNS TO OLMSTED FALLS – THIS SATURDAY, APRIL 30TH. Olmsted Falls PTA Council is working once again with the Olmsted Falls Police Department and the Drug Enforcement Task Force to bring Operation Medicine Cabinet back to our community on Saturday, April 30th. The event will run from 10 am to 2 pm with the collection drop off point at the Olmsted Falls Police Department 26100 Bagley Road. Expired prescription and over-the-counter medications in SOLID form only will be collected by uniformed officers and held for safe disposal by a licensed company. Olmsted Falls along with other communities will be participating in this worthwhile event so please inform your friends and family in other communities to check the Drug Awareness and Prevention website at www.DrugAwarenessAndPrevention.com for links to other community drop off points. Please click here for a flyer for the Olmsted Falls event. OPEN AUDITIONS FOR DISNEY’S SLEEPING BEAUTY KIDS – THIS SATURDAY, APRIL 30TH at the Olmsted Community Center, 8170 Mapleway Drive. Auditions are open for all actors in first through ninth grade. 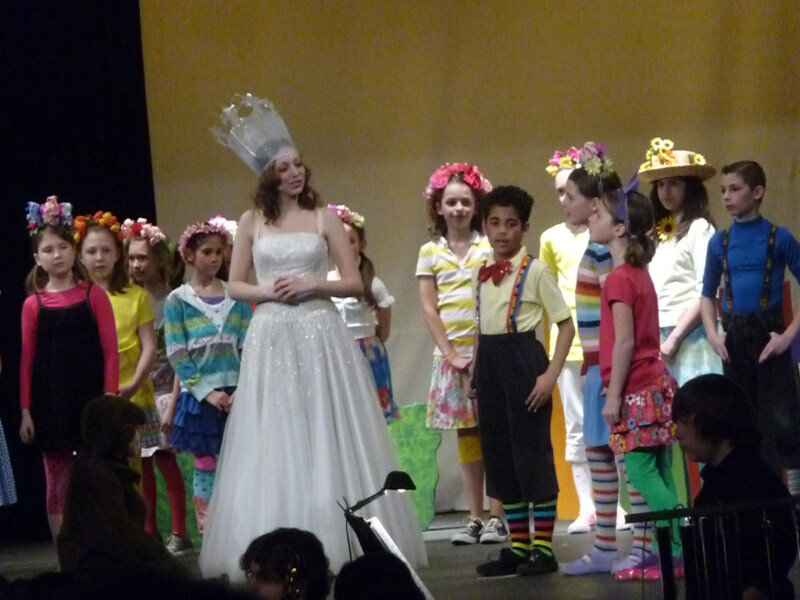 Olmsted Performing Arts will perform this Youth Theater show July 29th-30th. Rehearsals will begin on Monday, May 2nd, and will be held on Monday and Friday evenings, as well as on Saturday afternoons. Additional details are available at: http://www.olmstedperformingarts.com/youthTheater.php. OLMSTED FALLS ACADEMIC TEAM ANNUAL MOTHER’S DAY FLOWER BASKET SALE THROUGH MAY 3RD – Beautiful hanging flower baskets available in time for Mother’s Day at $14.95 each. Order by May 3rd; pick-up on May 6th. Please click here for selections and order form. OLMSTED FALLS RELAY FOR LIFE EVENT – Saturday, June 11, 2011 from noon to noon Sunday, June 12, 2011 at Olmsted Falls High School. It is never too late to join this great cause and register as a survivor or to start your own team. For questions please call Co-Chairs Michelle LaGruth at 440-476-4697 or Lisa Brady at 216-870-8256. We are pleased to confirm that last week Governor John Kasich signed House Bill 36, which increases the number of calamity days for this year from three to five. This makes it official, and we can now say with complete certainty that our last day for students this school year will remain June 7th as originally planned. To download a copy of the 2010-2011 Academic Year Calendar for Olmsted Falls Schools, please click here. Last week was National Volunteer Week. Olmsted Falls School District is truly fortunate to have a large number of parent and community volunteers working to enhance the learning environment for our students each day. We extend our sincere thanks to all of the volunteers for their efforts in our schools! These individuals truly help make a difference! Students and staff at the Early Childhood Center took the opportunity to recognize three volunteers from the community who come in each week to read to our littlest Bulldogs. Each of these volunteers live in the Columbia Park neighborhood adjacent to the ECC. Students look forward to their special visits, and were excited to surprise them with special cards and thanks! 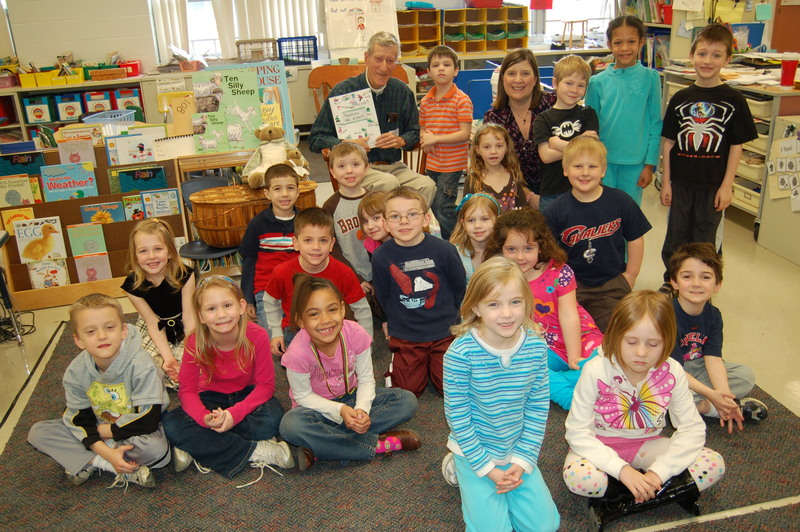 ECC students recognize volunteer reader, Mr. Bill Kubat. 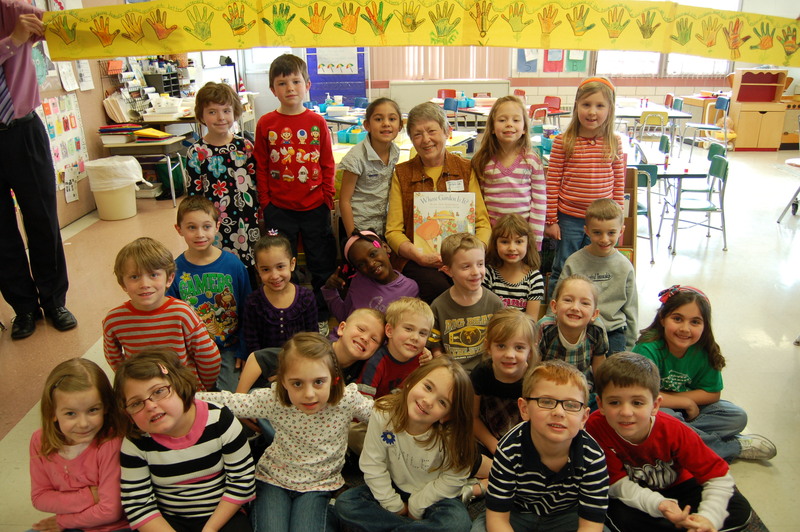 ECC students recognize volunteer reader, Mrs. Mary Kubat. The annual OFIS Spring Band & Choir Concert is scheduled for tomorrow evening, April 21st at 7:00 p.m. in the Middle School Cafetorium. Students from Olmsted Falls Middle School embarked on the annual 8th grade trip to Washington, D.C. last week with a packed itinerary ahead of them. During the 3-day adventure, students and chaperones visited: Arlington National Cemetery (including the Tomb of the Unknown Soldier and the home of General Robert E. Lee), U.S. Capitol, White House, Jefferson Memorial, Lincoln Monument, Washington Monument, President Kennedy Gravesite, Korean War Memorial, Vietnam Memorial, WWII Memorial and Gettysburg Eternal Flame. The group also took a boat cruise on the Potomac River. U.S. Army Capt. Michael McClelland (OFHS Class of 2000 alumnus) with OFMS students at Arlington National Cemetery during the 8th grade trip to Washington, D.C. last week. This year’s stop at Arlington National Cemetery was an extra special experience this year. 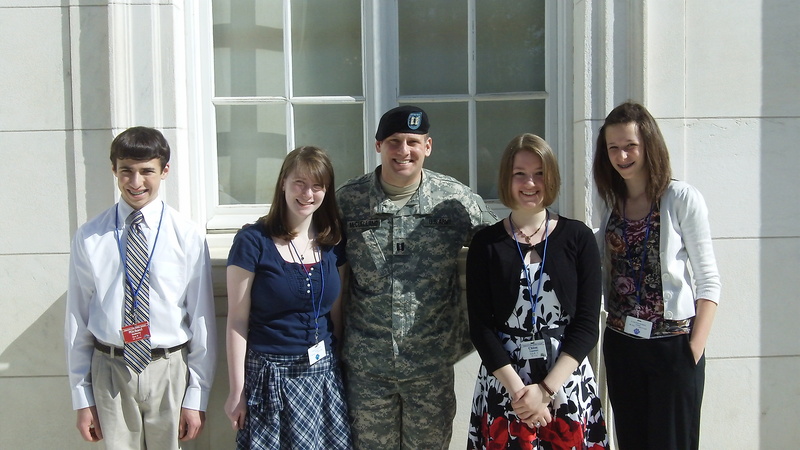 The students were joined by U.S. Army Capt. Michael McClelland (OFHS Class of 2000 alumnus). Capt. McClelland helped students place a wreath at the Tomb of the Unknown Soldier, and spent time talking with students. Thank you Capt. McClelland for making the time for this special visit! To view a gallery of more photos from the trip, please click here. The 2.8 Mill Permanent Improvement Levy on the May 3rd election ballot is a very important issue for the Olmsted Falls School District. The last in a series of five public information meetings on the topic was held last night. Any parents or residents who need additional information or have questions on this important ballot issue – which WILL NOT increase the current level of school taxes – are urged to contact the Board of Education office at 440-427-6000. DO YOU NEED A NEW OR REPLACEMENT “YES FOR SCHOOLS” YARD SIGN? If you would like to request a yard sign or need to replace one that has been blown away in the recent weather, please e-mail your request to prideinolmstedschools@gmail.com with the phrase “Yard Sign” as the subject. Provide your name and street address in the e-mail, and a sign will be delivered to your yard. In recent weeks, girls and boys soccer teams have brought home championships to the Olmsted community. Congratulations to these talented and athletic young women and men from our District. The girls teams did well last month in the NOGSL (Northern Ohio Girls Soccer League) league tournament. The U10-Gold team and U12 team both were champions in their age groups. These same two teams, along with the U14 girls team, went on to win championships in their age groups in the Rocky River IceBreaker Invitational. Between them, they brought FIVE CHAMPIONSHIPS to OlmstedFalls. Additionally, the U13 boys team were Runners-Up in the Rocky River IceBreaker Invitational. Read more about these athletes, teams and their accomplishments at: http://olmstedsoccer.wordpress.com/. 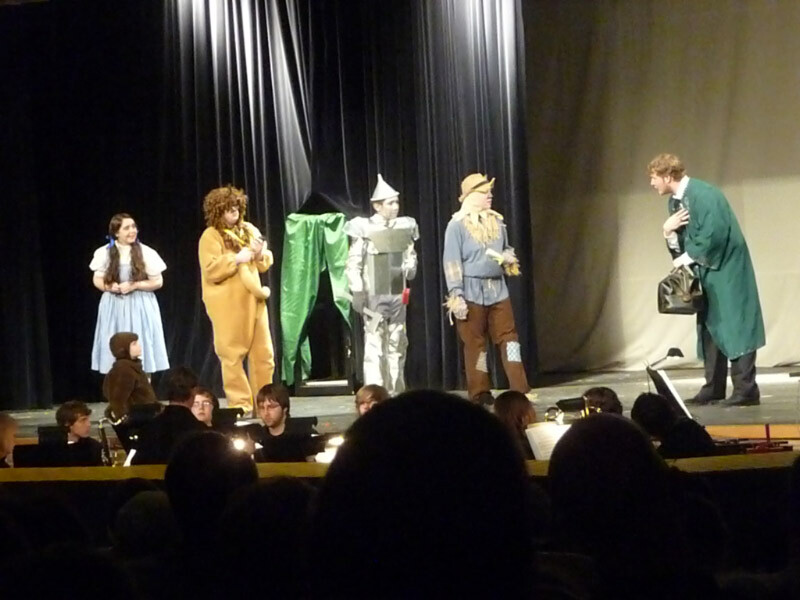 OFHS Masquers production of “The Wizard of Oz” last weekend was performed in front of capacity crowds in the OFHS auditorium. The sold out shows received rave reviews. Great job to the OFHS Masquers and the younger Bulldog actors and actresses who joined them! Congratulations to the winners of the Dance It Up 4 Kids Health Raffle! Alice Miller from Falls-Lenox won the free flooring from Figz Floors (440-666-6641); Marie Tessier from OFIS won the Lake Erie Fishing Charter from Blue Dolphin Charters (216-849-4954); and Eileen Wallace from Falls-Lenox won the Radisson Hotel Airport/Akron Symphony “Date Night” Package. Thank you to everyone who purchased tickets to support our little ones and to the companies who donated so generously. If you patronize one of these companies please thank them for supporting our schools. This raffle raised over $600! JOIN PTA FOR THE FRIDAY NIGHT LIVE TALENT SHOW!! – April 29th at 7:00 p.m. in the Olmsted Falls High School Auditorium – $5.00 donation at the door. Student Talent, Local Judges, Lots of Family Fun!! Mark your calendars! OPERATION MEDICINE CABINET RETURNS TO OLMSTED FALLS ON SAT., APRIL 30TH. Olmsted Falls PTA Council is working once again with the Olmsted Falls Police Department and the Drug Enforcement Task Force to bring Operation Medicine Cabinet back to our community on Saturday, April 30th. The event will run from 10 am to 2 pm with the collection drop off point at the Olmsted Falls Police Department 26100 Bagley Road. Expired prescription and over-the-counter medications in SOLID form only will be collected by uniformed officers and held for safe disposal by a licensed company. Olmsted Falls along with other communities will be participating in this worthwhile event so please inform your friends and family in other communities to check the Drug Awareness and Prevention website at www.DrugAwarenessAndPrevention.com for links to other community drop off points. Please click here for a flyer for the Olmsted Falls event. OLMSTED FALLS MIDDLE SCHOOL PTA 4TH ANNUAL CALENDAR RAFFLE – $5 GIVES YOU 31 CHANCES TO WIN – REGISTER BY APRIL 29TH! Each day in May, a name will be pulled and winners will be notified. You may purchase as many calendars as you like. If you have friends, family or coworkers that may enjoy this opportunity, please pass it along to them. Please click here to download your raffle calendar. Registration form must be returned with money to your school office by April 29th in an envelope marked OFMS PTA to be eligible. Checks should be made payable to OFMS PTA. Money raised will be used for assemblies, field trips and scholarships. OLMSTED FALLS RELAY FOR LIFE EVENT – Saturday, June 11, 2011 from noon to noon Sunday, June 12, 2011 at Olmsted Falls High School. It is never to late to join this great cause and register as a survivor or to start your own team. For questions please call Co-Chairs Michelle LaGruth at 440-476-4697 or Lisa Brady at 216-870-8256. Last Friday, the Ohio Department of Education released a spreadsheet detailing the specific financial impact of the Governor’s proposed biennium budget on local school districts across the Ohio. Please click here if you are interested in reviewing this 14-page document. It is important to note that these figures are simply estimates that were generated from the Governor’s proposed budget. As this legislation moves through the Ohio Legislature, things will almost assuredly change. However, the general trend strongly points to a future with fewer state dollars flowing to Olmsted Falls Schools. With these cuts to education at the state level, passage of the District’s upcoming 2.8 Mill P.I. Levy is of the utmost importance. Having this dedicated revenue stream for permanent improvement projects and purchases will help relieve the District’s already stretched general fund by providing funding for significant building maintenance projects at aging facilities as well as allowable capital purchases. Passage of the 2.8 Mill P.I. Levy will also help lengthen the span of time before the next operating levy is needed. The 2.8 Mill Permanent Improvement Levy on the May 3rd election ballot is an increasingly critical issue for the Olmsted Falls School District (see item on State cuts above). Any parents or residents who need additional information or have questions on this important ballot issue – which WILL NOT increase the current level of school taxes – are urged to attend next week’s meeting. The overview presentation on the P.I. Levy is very brief (about 15 minutes) and is followed by an opportunity for Q & A on the issue with Superintendent Dr. Todd Hoadley. The final Public Information Meeting is scheduled for next Tuesday, April 19th at 7 p.m. in the OFHS Library Media Center. DO YOU NEED A “YES FOR SCHOOLS” YARD SIGN? Simply e-mail your request to prideinolmstedschools@gmail.com with the phrase “Yard Sign” as the subject. Provide your name and street adress in the e-mail, and a sign will be delivered to your yard. Olmsted Falls School District is pleased to announce that a partnership has been finalized between the District and the 501c3 non-profit organization Olmsted Community Outreach. This new partnership will help meet the growing needs of parents in our community by providing child care programs within the District’s Early Childhood Center facility located on Fitch Road. Olmsted Community Outreach has signed a 2-year lease agreement with Olmsted Falls School District to rent vacant classrooms in the Early Childhood Center. It is important to emphasize that no school funds are being used to support this new program. All Olmsted Community Outreach program operations, and decisions regarding operations, will be made by the Olmsted Community Outreach administration. Olmsted Community Outreach will provide child care and summer camp programs for students in kindergarten through 5th grade. For additional information on the new Olmsted Community Outreach program, please visit: http://www.ocoutreach.org/. As a District, we are pleased to have our facilities utilized to benefit parents in the community. Please contact Olmsted Community Outreach Director Donna Winter at 440-782-1626 with any questions. There is going to be an ice cream social on Thursday evening during the Book Fair from 6 p.m. – 8 p.m. Please plan on joining us and supporting the Falls-Lenox Library and Media Center! 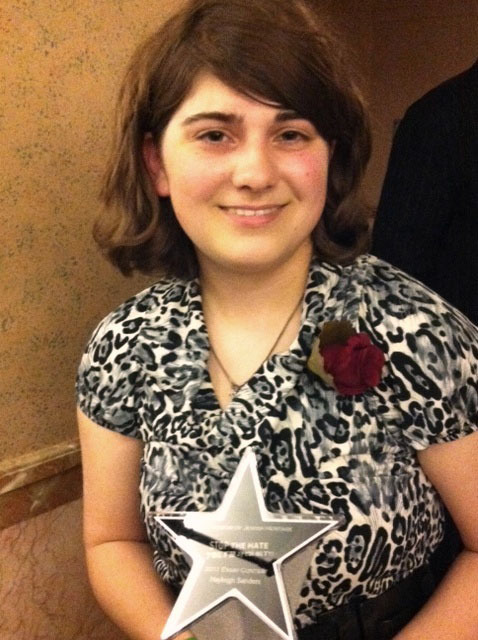 Congratulations to Olmsted Falls High School’s Hayleigh Sanders on being named second runner up in this year’s “Stop The Hate: Youth Speak Out!” essay contest sponsored by the Maltz Museum of Jewish Heritage. Hayleigh placed third overall in the pool of the more than 1,700 students from seven counties who participated in the annual contest. Hayleigh highlighted the High School’s recent “Let It Go” campaign in her essay and represented Olmsted Falls High School as a leader of change in our school! She was awarded with a $15,000 scholarship for her outstanding entry at a special awards gala held at Severence Hall this past weekend. School counselor Sherry Davis and teacher Mr. John Mercer joined Halyleigh and her family for this very special event. OFHS Masquers is proud to present The Wizard of Oz in the High School Auditorium THIS FRIDAY, APRIL 15th and SATURDAY, APRIL 16th. Both performances begin at 7:30 p.m.
Tickets are $7 for adults and $5 for students/senior citizens. Tickets may be purchased at the door or by calling 440 427 6070. Come out and enjoy our talented drama students performance of this family-friendly classic! Olmsted Falls swimmer Amanda Paliska signed a formal letter of intent this week to continue her swimming career at Eastern Michigan University next fall. Amanda, a senior at Olmsted Falls High School, holds nine school records, is a four time Southwestern Conference Champion in the 100 Butterfly and the 200 Individual Medley, and was voted the Southwestern Conference MVP this past winter season. Amanda is also an OHSAA two-time state qualifier and has competed in various events at the C.T. Branin Natatorium at Canton McKinnley High School. Amanda decided on Eastern Michigan University based in large part on the family atmosphere created by the current swimmers, the relationship with the coach, and the rich swimming tradition of which the school is very proud. Amanda will study accounting at Eastern Michigan’s business school. Congratulations Amanda! Best of luck at Eastern! Dr. Hill hosted his monthly Principal’s Lunch last Friday. This month’s lunch had a change in the usual format in order to honor students who work with others students in need at the High School. Students (pictured from left to right) Erin Chalfant, Jill Mesaros, Cari Lyzcek-Roser, Victoria Cho, Dennis Glenn, Jessie Feldman and Chelsea Craft, joined Dr. Hill for lunch and were recognized for their efforts to help others. 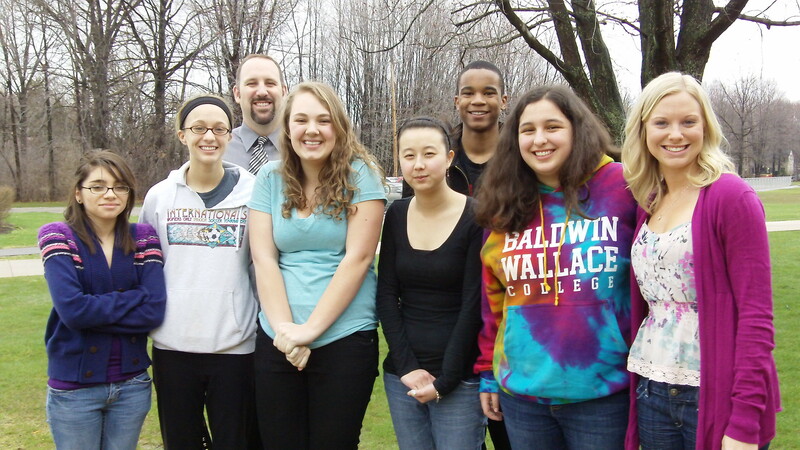 To read more about these outstanding student volunteers at Olmsted Falls High School, please click here. Third grade parents (as well as anyone else interested) are invited/ encouraged to attend this special joint meeting. Please plan to arrive at 6:00 PM for a guided tour of the Intermediate School and then enjoy pizza, drinks and dessert. We encourage you to stay for our PTA meeting to hear about the many student activities available at the Intermediate School and learn how you can be involved in PTA. Please note this combined PTA meeting will take the place of the F/L-ECC April meeting. There will be no F/L-ECC meeting on April 26th. Coach Ryan speaks to guests at Annual Golden Deeds Banquet where he was honored earlier this month. 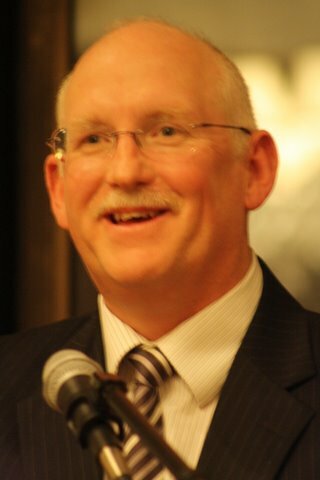 Olmsted Falls Varsity Football Coach Jim Ryan was awarded the Golden Deeds Award by the Greater Cleveland Football Coaches Association at a special banquet held earlier this month at the Crowne Plaza Hotel in Independence. The Golden Deeds Award is presented to individuals who have made important contributions to high school football in Northeast Ohio and to the activities of the Greater Cleveland Football Coaches Association. Congratulations to Coach Ryan on this well-deserved honor! OFHS Assistant Football Coach John Gaba was also recognized at the same banquet as the Assistant Coach of the Year by the Greater Cleveland Football Coaches Association. Congratulations again to Assistant Coach Gaba on that honor! Olmsted Falls is truly fortunate to have such top caliber coaches in our athletic program. Last Saturday, April 9th, Olmsted Falls Middle School had 101 individual entries in 39 events for the Ohio Music Association Solo and Ensemble Contest held at Cuyahoga Community College. Mrs. Jennifer Call, Mrs. Joy Kiedrowski, and Mr. Kevin Gulden, their directors, helped develop the talent of these budding musicians. Al Demkowicz, Bo Ptak, Tim Strelau, Michael Feller, Mark DeMio, Stephanie Yehlik, Erica Norton, and Sherri Kovach provided outstanding coaching of these groups. Student preparation included before school, after school, during lunch, weekend and evening practices. The following students received “Excellent” ratings: Ethan Novilla, Max Molkentin, Michael Iler, Stephen Miller, Michael Doherty, Christina Pinter, Sammie Fagan, Kala Marshall, Ally Perez, Megan Garrett, Erika Darnell, Lauren Boros, Stormie Kadar, Justin Peck, Shaun Whitt, Caitlin Sumerauer, Gia Newsome, Cheyenne Robertson, Nick Sanchez, Taylor Hassel, Alisha Good, Austin Lockhart, Christine Bolton, Kayla Burk, Isabel Struk. These students received “Superior” ratings: Yahia Ali, Erik Pfisterer, Alex Lohn, Morgan Ashton, Mae Coupland, Erin Hetchler, Vincent Challenger, Keanna Strelau, Alex Zbiegien, Madison Lamlein, Emily Laycock, Drew Oltmanns, Taylor Hassel, Michael Doherty, Christine Bolton, Claire Barratt, Mallory Taylor, Logan Petruziello, Austin Miller, Marcus Green, Matt Helmick, Colleen Prokop, Seth Bennett, Zach Boscarello, Julia Burnell, Lindsay Rader, Jennifer Bertrand, Paige Bokman, Jessica Kukura, Carissa Eubank, Taylor Hannah, Marilyn Paine, Stephen Miller, Caleb Budic, Jamie Dregalla, Ricky Gaughan, Kaitlyn Allman, Emma Whitney, Bridget Bush, Andi Gottfried, Liz Neudeck, Olivia Sarik, Breanna Palkovic, Savanajh Black, Brian Kohler, Abby Staten, Jacob Conder, Jacob Horvath, Emily Raffay, Conner Arendec, Caitlyn Webb, Skye MacEwan, Sydney Martin, Damaris Pierce, Kayla Burk, Nada Sperry, Kait Gillette, Maggie Bildstein, Jocelyn Breisacher, Ashley Campbell. Congratulations to ALL on these outstanding performances! 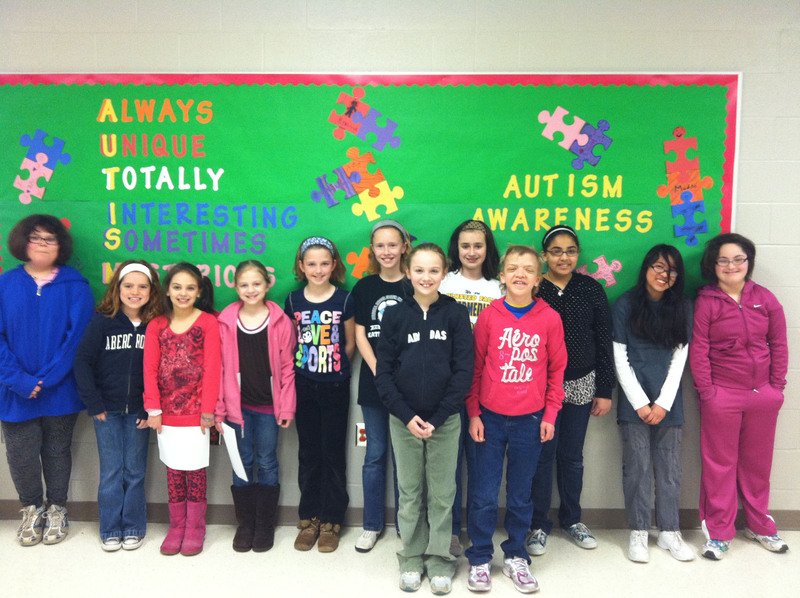 Intermediate School students from the classes of Ms. Giamboi and Mrs. Stanczak are celebrating Autism Awareness Month. Students worked together on special bulletin boards and door displays to increase awareness and understanding of autism. Well done! During five days in February, the students in Mrs. Schuler’s Social Studies classes had an opportunity to participate in a program entitled “Our Nation” offered through the Junior Achievement organization. About 85 students heard and learned first-hand about businesses’ need for individuals who can meet the demands of today’s job market, including high growth and high-demand jobs. “Our Nation” covered the concept of globalization, production and the need for students to be entrepreneurial in their thinking to meet the requirements for careers worldwide. 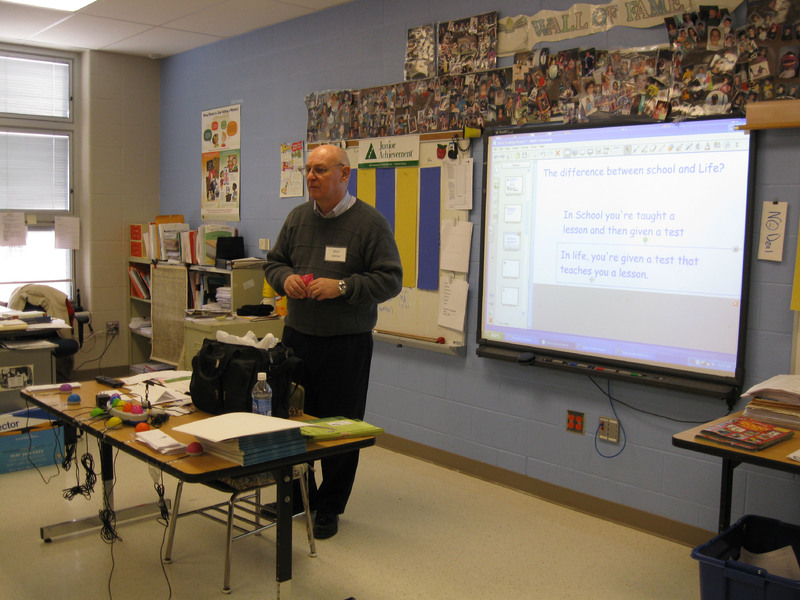 As a result of Mr. Svec’s meeting with representatives from Junior Achievement, a door was opened for Transportation, Logistics, and Supply Chain expert Mr. Bruce Serfass to come to Olmsted Falls Intermediate for the first time. Transportation, Logistics, and Supply Chain expert Mr. Bruce Serfass speaks to OFIS students as part of the Junior Achievement “Our Nation” program. As part of the “Our Nation” program, Mr. Serfass let students practice being entrepreneurs, explore business organizations, learn about resources and how they apply to technology and workers, and learn how to examine the skills needed to obtain jobs such as writing a simple resume. Thank you to Mr. Serfass for helping introduce our students to today’s global workplace! First, our congratulations to WKYC Student Athlete of the Week Denton Sagerman. 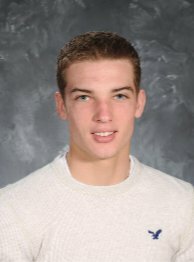 Denton is a senior at Olmsted Falls High School and a pitcher for the Bulldogs’ baseball team. Along with helping Olmsted Falls to the state tournament last season, Denton has maintained a 4.1 GPA. Denton was also recently awarded the 1st Place $2,000 Southeastern Baseball Classic Scholarship. Varsity Bulldog Baseball Coach Dan Largeant and the entire Bulldog baseball team were also featured on WKYC HighSchoolSports.net web page this week. CUYAHOGA COUNTY COUNCILMEMBER DAVE GREENSPAN HOSTS APRIL TOWN HALL MEETING AT OLMSTED FALLS MIDDLE SCHOOL MEDIA CENTER – THIS THURSDAY, APRIL 14TH AT 7:00 P.M. – All parents and residents are invited and encouraged to attend. The Councilmember’s Town Hall Meetings are open to all residents of Cuyahoga County and are a great way to learn about what is happening in the new county government. This month’s Town Hall Meeting will focus on the Public Works projects affecting Olmsted Falls and Olmsted Township. Cuyahoga County Public Works Director Bonnie Teeuwen and other members of the Public Works department will be present to answer questions and field constituent comments. The Town Hall Meeting format also provides an opportunity for constituents to address any issues, subjects or concerns that are important to them, the district and the county. FALLS-LENOX PRIMARY SCHOOL CARNIVAL FOR A CURE – THIS FRIDAY, APRIL 15TH FROM 6:00 – 9:00 P.M. – Are you looking for a fun night out with your student? Join us at Falls-Lenox for a primary Carnival for a Cure. Enjoy carnival games, a cake walk, line dancing, walking to find a cure for cancer, face painting, luminaria remembrances, dinner, the principal’s challenge, and fun with your teachers and friends. If you haven’t already – RSVP to your teacher (grades 1-3), so we can make sure we have enough food and prizes! $5 per student/adult donations accepted; Quick Dinner available for $2 each. Parking will be tight, please carpool. Hope to see you there! Congratulations to Mrs. Kim Cleary on being selected as this year’s Helping Hand Award recipient for the state of Ohio! 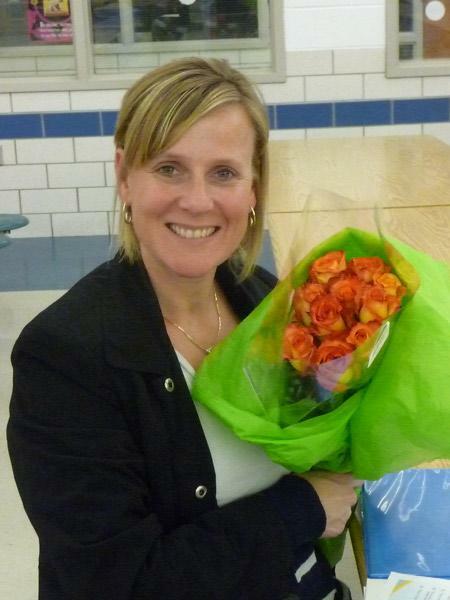 Mrs. Cleary is currently an active member of the Falls-Lenox/ECC, OFIS, and OFMS PTA units. She is also an active member of the Olmsted Falls PTA Council. In addition to her many PTA involvements, Mrs. Cleary also helps coordinate the Olmsted Falls Soccer Association, teaches PSR classes and has been active with the Pride In Olmsted Schools committee. She is always there to lend a hand and this recognition is truly well-deserved. Mrs. Cleary was nominated by fellow PTA parent, Mrs. Linda Parkowski. Mrs. Cleary’s nomination advanced from the local PTA Council level to the PTA District 12 level, where it was selected to advance to the state level as the official nomination from District 12. The Ohio PTA reviewed nomination forms for outstanding PTA volunteers from across the state. Mrs. Cleary was selected as the Ohio PTA Helping Hand Award winner and she will be formally recognized at the upcoming Ohio PTA Conference. Olmsted Falls is truly fortunate to have outstanding parent involvement and support in our education community. Mrs. Cleary exemplifies this involvement. We again extend our congratulations! OFHS Wins NAQT State Championship! Pictured (L to R): Asst. 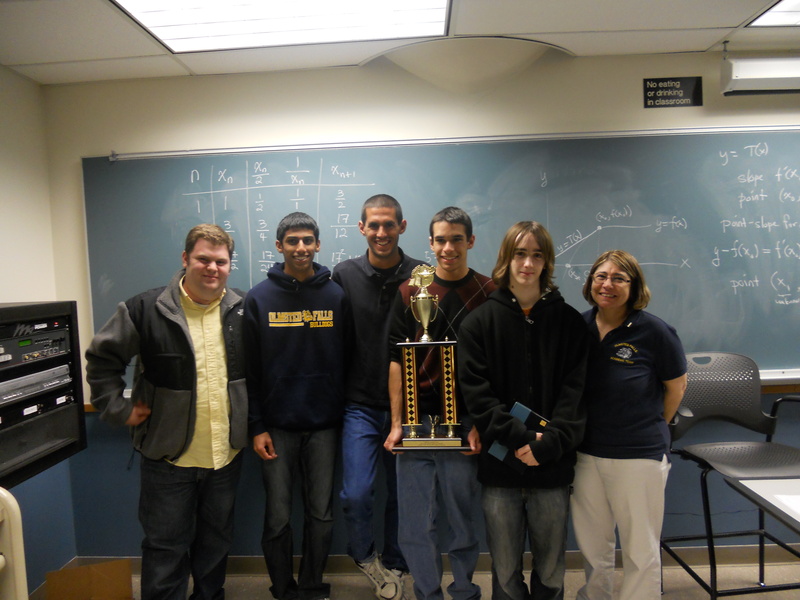 Coach Joe Gaela, Academic Team members Jim Coury, Mike Coury, Sohan Vartak and Marty Mendenhall, and Coach Rhonna Smith. Last Saturday, the Olmsted Falls High School Academic Team competed in the National Academic Quiz Tournament (NAQT) State Championship at The Ohio State University in Columbus. Our A-Team consisted of: Jim Coury (team captain), Mike Coury, Sohan Vartak, and Marty Mendenhall. After championship round play, there was a three way tie between Northmont, Copley, and Olmsted Falls. Tie breakers came into play with Northmont and Copley needing to play off against each other for the right to play Olmsted Falls for the State Title. Copley beat Northmont which set up a rematch between Olmsted Falls and Copley. In a nail biting, gripping match that wasn’t determined until the last question, Olmsted Falls came out on top 345-330! Olmsted Falls has another State Championship! Also, the Academic Team’s Annual Mother’s Day Flower Basket Sale is currently underway. Please click here for additional information. 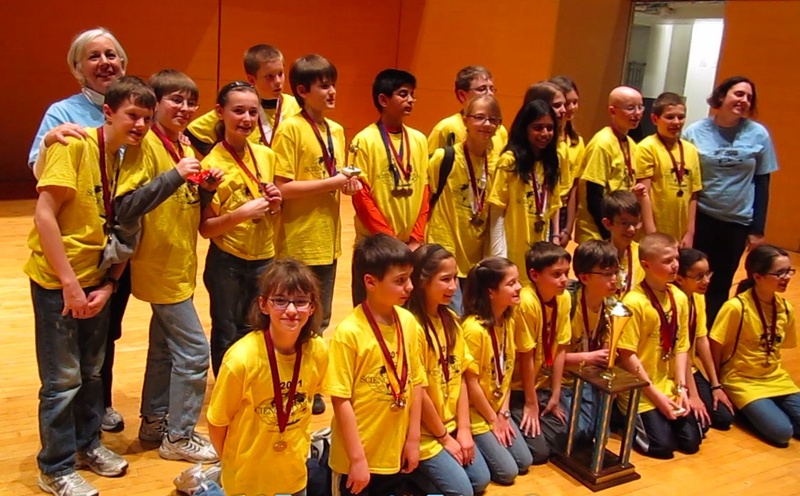 Olmsted Falls Science Olympiad Team Takes 3rd Place in Elementary Science Olympiad competition! On Saturday, March 26th, the Olmsted Falls Science Olympiad Team competed in the Elementary Science Olympiad at Cleveland State University. The twenty-five 4th, 5th and 6th graders who represented Olmsted Falls in the competition spent the last five months studying and practicing for the 24 events of the Olympiad. Students competed against other well-prepared teams from Northeast Ohio to recall knowledge, demonstrate understanding, apply concepts, build models and solve problems in their events. the stage to claim their trophy in excellent company with other top-five finishers Shaker, Solon, Hawken and Berea. Olmsted Falls Science Olympiad Team members include: 4th graders Nadean Ali, Mia Colozza, Annelise Gomez and Claudia Schuh; 5th graders Jacob Dahlinger, Joe d’Aliberti, Shalin Desai, Danny Doherty, Natalie Partin, Madison Plumlee, Trevor Rodgers, Esha Vartak and Bill Wendling; and 6th graders Noah Broski, Alexa Gomez, Kaylee Gomez, Bennett Graham, Alex Kho, Casey Komar, Carson Moore, Caitlin Poore, Joselyn Rabbitt, Nick Romanowski, Stephanie Schroth and Eli Tomasch. For additional information including a recap of individual student results, please click here. Congratulations to these outstanding students, and much appreciation to the staff and parents who helped make this experience a success! Coaches of this year’s team are Peggy Morris, Anne Miskimins, Cindy Rodgers and Joe Morris. Teachers Mike Moore and Anne Miskimins, and parent Cynthia Tomasch, generously volunteered to judge events. Many parents of team members chaperoned and provided support throughout the day. Another great year of Bulldog determination and success! With less than one month to go before the May 3rd election and absentee voting already underway, efforts continue to increase awareness about the critical need to pass the 2.8 Mill P.I. Levy – which will not raise the current level of school taxes for residents. Yard signs began going up over the spring break and requests are continuing to be filled. Thank you to all of the parents and staff members who have offered to place a sign in your yard! This effort has already helped to increase awareness for the community at large. If you are interested in having a “Yes for Schools” sign placed in your yard, please click here to submit a request. 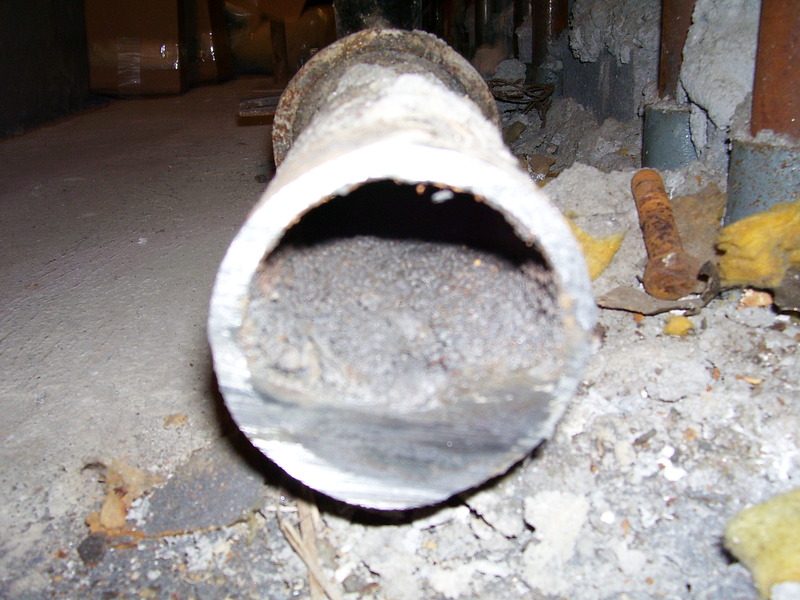 Cross-section view of original plumbing pipes at the High School currently contain significant blockage due to decades of built-up sediment deposits. With the cuts to education at the state level, passage of this P.I. Levy is of the utmost importance to provide the District with a dedicated revenue stream for building maintenance and upkeep. Having this dedicated revenue stream will be critical to completing projects, such as electrical and plumbing systems upgrades/renovations at the High School, without having to tap into already stretched general fund dollars. Another public information meeting was held last evening at the Olmsted Falls Library branch. The final public information meeting is scheduled for Tuesday, April 19th at 7 p.m. in the OFHS Library Media Center. Additionally, if any parent or resident is interested in hosting an informational, in-home “coffee talk” for a group of 10-15 friends, neighbors and/or family members, please contact Superintendent Dr. Todd Hoadley to schedule. These in-home presentations feature a 20 minute Power Point and an opportunity for Q & A with a District Administrator or School Board member. 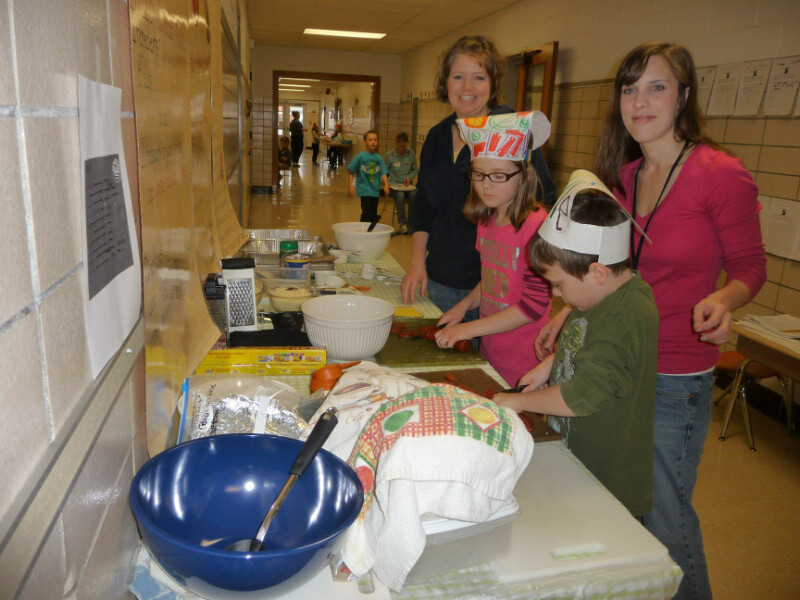 Parent volunteers Kristie Patton and Kerrie Kruichuk help the second grade class put reading and math skills to work with a special "Pizza Day" project at Falls-Lenox. Second grade students at Falls-Lenox had an opportunity to put their reading and math skills to work with a fun, hands-on project earlier this week. Parent volunteers joined in to help with “Pizza Day” – an interactive lesson combining reading and math skills with pizza making. Students did a great job at following the instructions and ended up with a delicious reward in the end. Thanks to the second grade teachers and parent volunteers for bringing together this fun and educational activity! 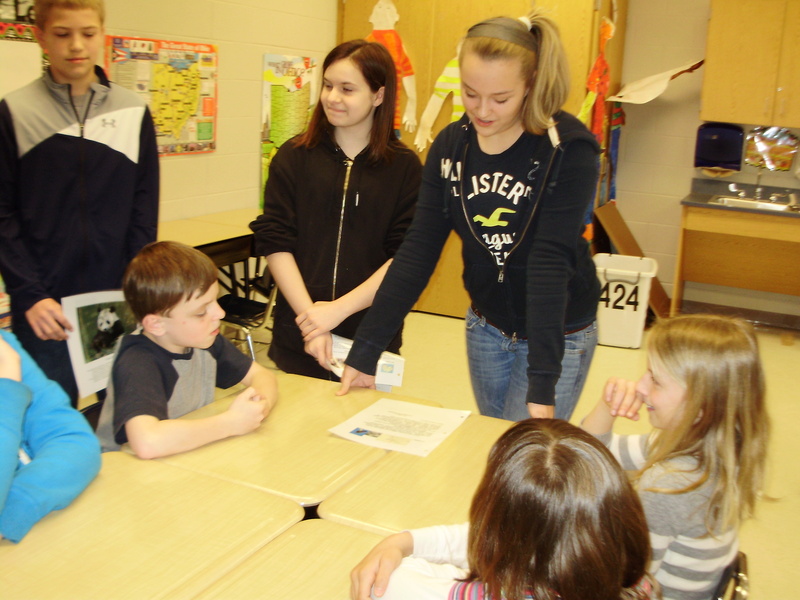 Middle School students share original stories with younger bulldogs at Olmsted Falls Intermediate School. On Thursday, March 24th, Mrs. Messenheimer’s seventh-grade English classes visited Olmsted Falls Intermediate School to share books that they wrote for Mrs. Ambrosia’s fourth-grade classes. Both seventh-grade classes wrote a picture research book modeled after Around the World: Who’s Been Here? by L.B. George. Each student chose an endangered animal to research. After gathering the facts about the animal’s habitat, diet, and life, each student wrote a page about their animal without naming it. The final line was “Who’s been here?” which allowed the fourth graders to guess before the answer was revealed on the next page. The seventh graders were anxious to see the final product, complete with colored maps, habitat photos and of course a picture of the mystery animal! However, they were more excited to share the books with their audience. All of the students in both grades enjoyed the real-life writing experience and learning more about some unique animals. Olmsted Falls School District has been recognized for its participation in the Partnership for a Healthier America’s Chefs Move! initiative. Our District will receive approximately $2,000 worth of safe, easy to use cookware that can be used in coordination with local chefs to continue efforts to empower teachers, parents and students to participate in healthy cooking. 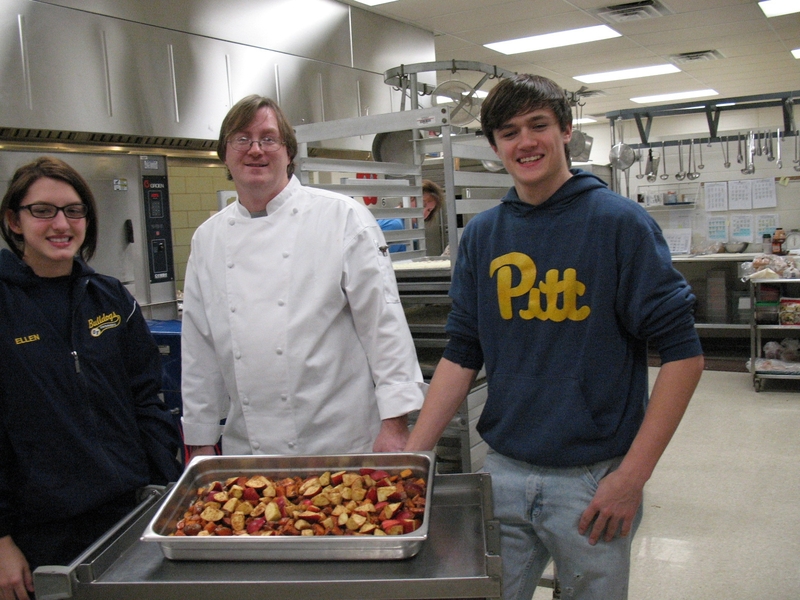 Chef Dean recently worked with OFHS students as part of the Partnership for a Healthier America's Chefs Move! Program. The Olmsted Falls School District is a leader in student and staff wellness and was selected to participate in the initial Chef’s Move! project last fall. The Partnership for a Healthier America, which includes First Lady Michelle Obama as its Honorary Chair, partnered our District with an area chef for the first phase of the pilot project. Local chefs partner with classrooms to help promote positive culinary practices such as nutritious cooking and healthy seasoning, as well as safe and sanitary kitchen habits. Olmsted Falls Director of Food Services Denise Tabar is seeking to expand the Chefs Move! program by partnering with local chefs right here in the Olmsted community. Please contact Mrs. Tabar at 427-6440 or dtabar@ofcs.net if you know a local chef who might be interested in participating. Students in the Paw Print Newspaper Club at Olmsted Falls Middle School traveled to the Quicken Loans arena downtown for a special Journalism Day field trip. 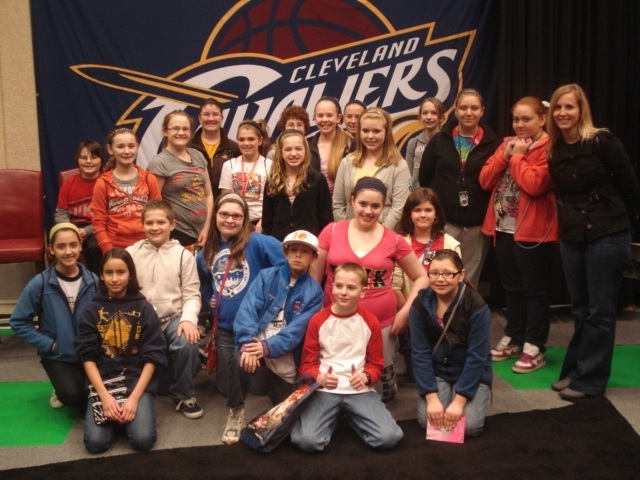 Just before the spring break recess, twenty-two students from the Paw Print Newspaper Club at Olmsted Falls Middle School traveled to the Quicken Loans arena downtown for a special Journalism Day field trip. The students listened to presentations from the Cleveland Cavaliers beat writer, the Executive Director of the Ohio Newspaper Association, and the Director of Corporate Communications at The Q. The OFMS students were very engaged in the presentations and asked many questions of the speakers. Then the group was taken on a complete tour of the arena where they got to see the Cavaliers’ offices, locker room, press areas, and VIP suites. The trip culminated with an opportunity to watch the Lake Erie Monster’s hockey team get a big 2-1 win! Overall, the trip was a great success and very beneficial for this group of interested future journalists. Falls-Lenox hosts the Scholastic Book Fair next week, April 11th – 15th. Great selection of books and gifts! Plan to stop by and check it out. 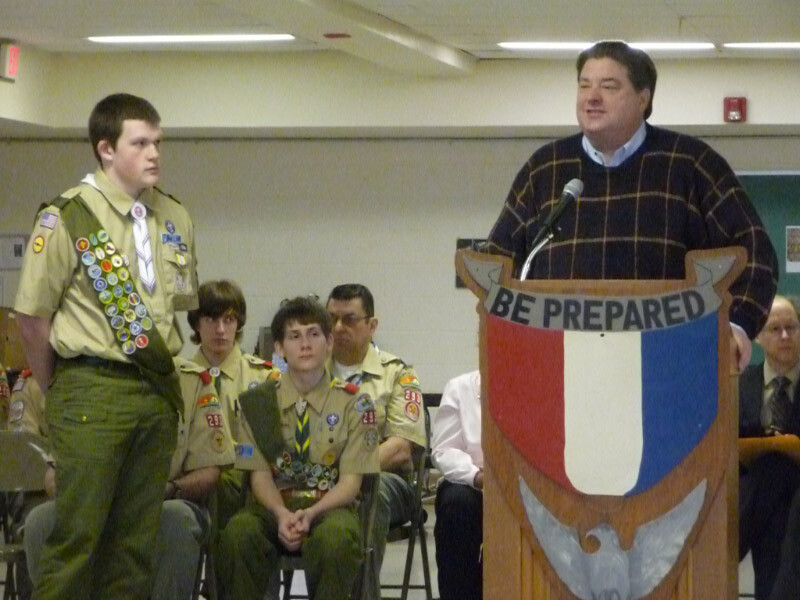 Monday, April 11th – 3 to 4 p.m.
Tuesday, April 12th – 6 to 8 p.m.
Wednesday, April 13th – 3 to 4 p.m.
Thursday, April 14th – 6-8 p.m.
State Senator Tom Patton helps recognize OFHS students Ben Coyle at Troop 293's Eagle Court of Honor. 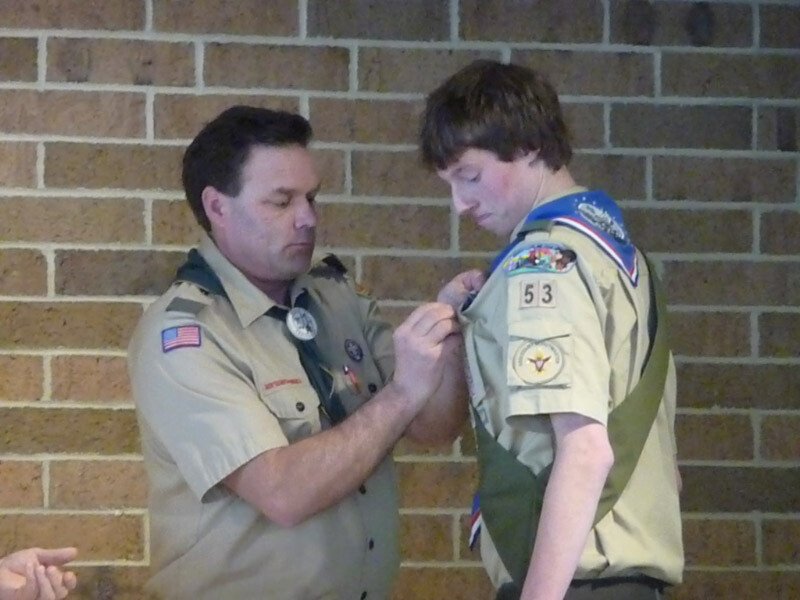 OFHS student Nick Macek receives his Eagle Scout pin at Troop 53's Eagle Court of Honor. Congratulations to Olmsted Falls High School students Ben Coyle and Nick Macek on achieving Eagle Scout status! Each student was recognized at a special Eagle Court of Honor for their respective troops. Ben Coyle is a member of Troop 293 and Nick Macek is a member of Troop 53. This is a truly outstanding accomplishment for these young men. Congratulations again! Additional photos from February’s successful Ballroom Blitz fundraiser event have been posted on-line. Please click here to view the gallery. Thank you again to all who supported this wonderful event, and to the Olmsted Falls Music Association for its continuing support of music education in our schools! CUYAHOGA COUNTY COUNCILMEMBER DAVE GREENSPAN HOSTS APRIL TOWN HALL MEETING AT OLMSTED FALLS MIDDLE SCHOOL MEDIA CENTER – THURSDAY, APRIL 14TH AT 7:00 P.M. – All parents and residents are invited and encouraged to attend. The Councilmember’s Town Hall Meetings are open to all residents of Cuyahoga County and are a great way to learn about what is happening in the new county government. This month’s Town Hall Meeting will focus on the Public Works projects affecting Olmsted Falls and Olmsted Township. Cuyahoga County Public Works Director Bonnie Teeuwen and other members of the Public Works department will be present to answer questions and field constituent comments. The Town Hall Meeting format also provides an opportunity for constituents to address any issues, subjects or concerns that are important to them, the district and the county. 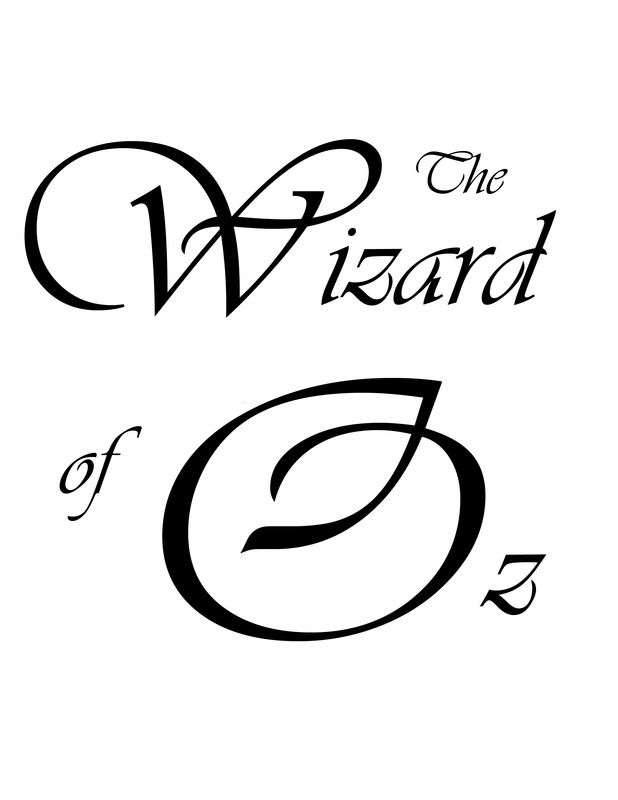 OLMSTED FALLS HIGH SCHOOL MASQUERS PRESENTS THE WIZARD OF OZ – FRIDAY, APRIL 15TH AND SATURDAY, APRIL 16TH AT 7:30 P.M. – Open to the public. Both shows begin at 7:30 in the high school auditorium. Tickets are $7 for adults and $5 for students/senior citizens. Tickets may be purchased at the door or by calling 440 427 6070.